Home > History Section > Waffen-SS Divisions > 7. SS-Freiwilligen-Gebirgs-Division "Prinz Eugen"
Apr. 1942: SS-Freiwilligen-Division "Prinz Eugen"
Okt. 1942: SS-Freiwilligen-Gebirgs-Division "Prinz Eugen"
Okt. 1943: 7.SS-Freiwilligen-Gebirgs-Division "Prinz Eugen"
The Prinz Eugen SS Division was one of four that SS Reichsführer Heinrich Himmler formed in Yugoslavia during World War II. The second SS Division formed was the 13th Waffen SS Division Handzar/Handschar, made up of Bosnian Muslims, the third was the 23rd Waffen SS Division Kama, also made up of Bosnian Muslims. The fourth SS Division formed was the 21st Waffen SS Division Skanderbeg in Kosovo-Metohija, made up mostly of Kosovo Albanian Muslims. On August 7, 1940, Gottlob Berger, head of the SS Main Office (SS-FHA, SS-Furuhngshauptamt) and in charge of Waffen SS recruiting, sent Reichsführer-SS Heinrich Himmler a memorandum outlining his plans for the recruitment of ethnic Germans (Volksdeutsche) from the Balkans into the Waffen SS. Following the invasion and occupation of Yugoslavia, the approximately 700,000 ethnic Germans, Volksdeutsche, living in Yugoslavia, were recruited by the Waffen SS. The SS-FHA approved the formation of the Volunteer Mountain Division (Freiwilligen Gebirgs Division) on March 1, 1942 to consist of Volksdeutsche from Serbia, the Banat region.The core upon which the Division was based around was the SS controlled Protection Force (Selbstschutz) made up of Volksdeutsche in Serbia and the Action Squadron (Einsatz Staffel) from Croatia. The final,official name for the Division would be the 7th SS-Freiwilligen Gebirgs Division “Prinz Eugen”, the 7th SS Volunter Mountain Division, named after Prinz Eugen of Savoy-Carignan, one of the greatest military commanders of the Austrian Hapsburg Empire.In l943, Himmler introduced compulsory military service for the Volksdeutsche in German-occupied Serbia. Approximately 21,500 ethnic Germans from Serbia would see service in Himmler’s Waffen SS. The Prinz Eugen Division was formed between April and October, l942. The staff of the Division was located in Pancevo and its lst Regiment at Weisskirchen,Austria. The leadership of the division was entrusted to SS Brigadefuehrer and Generalmajor of the Waffen SS, Artur Phleps, who on April 20,l942, was promoted to SS Gruppenfuehrer and Generalleutnant of the Waffen SS.Phleps, who had been a soldier in the Austrian Imperial Army, was a Volksdeutsche himself from Transylvania and commanded a Mountain Corps in the Romanian Army until l941.By December 31, 1942, the division would be made up of 21,102 men: 393 officers,2,010 NCOs, 18,699 troops. The officers and NCOs were almost entirely national Germans (Reichsdeutsche), Germans from Germany proper, while the enlisted men were Volksdeutsche, ethnic Germans outside the Reich, from Yugoslavia, Romania, and Hungary. SS conscription in the former Yugoslavia produced 42,000 Waffen SS and police troops.In Romania, 54,000 ethnic Germans were conscripted into the freiwilligen(volunteer) divisions.The Reichsdeutsche had a low opinion of the fighting ability of the Volksdeutsche, whom they dismissed as Mussulmaenner, Muslims, a term used by concentration camp guards to describe prisoners with little chance of survival.Nevertheless, Himmler and Berger were staunchly committed to exploit the manpower of ethnic Germans outside the Reich.Berger’s son-in-law, Andreas Schmidt, was the Volksgruppenfuehrer of the ethnic German Volksgruppe in Romania, where ethnic Germans were conscripted into the SS. On April 23, 1943, in a speech to SS troops in Kharkov in the Societ Union, Himmler declared: “One day we shall incorporate the millions of Germans living in America.” Before World War II, the total German population was estimated at over 100 million. One out of every three Germans lived outside the German Reich: 20 million Germans lived in Europe and 13 million in the Americas.In Yugoslavia, the total ethnic German population was over 700,000.Himmler and Berger perceived this manpower pool as ideally suited for recruitment into the Waffen SS. Moreover, they also sought to recruit non-Germans and non-Aryans into the SS. The Prinz Eugen SS Division was named after Prince Eugene of Savoy, whose name in German is rendered Franz-Eugen,Prinz von Savoyen-Carignan; in French, Francois-Eugene, Prince de Savoie-Carignan. Prinz Eugen was born in l663 in Paris,France, of the Italian House of Savoy. Frederick II, the Great of Prussia, who was tutored by Eugen, called him “the greatest war hero of our century” and Napolean regarded him as one of the seven greatest military commanders in history. Prinz Eugen made his first important contribution to military history at the Ottoman Turkish siege of Vienna in July, 1683. Grand Vizier Kara Mustafa, the “scourge of humanity”, had advanced with a large army from bases in Croatia and Bosnia-Hercegovina to encircle Vienna, the capital of the Hapsburg Holy Roman Empire.Austrian Emperor Leopold I fled to Passau. Eugen was made a colonel of a cavalry regiment. German troops and 16,000 Polish Hussars led by King John Sobieski marched to relieve the city. On September 12, the Polish cavalry descended from the hills around Vienna and defeated the Turkish forces, leaving 10,000 Turks captured or killed. Eugen distinguished himself in this battle. In 1687, Eugen advanced into Serbia to pursue the retreating Turkish Army and was wounded in l688 at the siege of Belgrade,which was taken from the Turks. The Serbian people and nation united with the Austrian government and military forces under Prinz Eugen in a joint effort to free Serbia from the Ottoman Turks. But this Serbian-Austrian offensive failed and in l690 the Turks retook Belgrade. The Serbian Patriarch Arsenius Cernoevitch led an exodus of 37,000 Serbian families out of Stara Srbija (Old or Ancient Serbia) to settle lands in what was then under Hungarian rule.This forced migration,or ethnic cleansing, left Stara Serbia depopulated of Serbs. Ethnic Albanians (Shqiptari) would settle this cleansed area, Kosovo-Metohija, Kosmet. The cleansed Serbs would settle in Vojvodina and Krajina. Eugen routed the Turks at Zenta, present-day Crna Gora (Montenegro), and then launched a cavalry raid into Bosnia-Hercegovina,capturing Sarajevo. The Treaty of Karlowitz of l699 resulted. Eugen again battled the Ottoman Turks when he attacked them at the Sava River. At the Battle of Peterwardein, outside Belgrade, 30,000 Turks were killed by forces under the command of Eugen. Eugen then invaded the Banat and captured Temesevar in October. In June, l7l7, Eugen attacked Belgrade, held by the Turks.Eugen vowed: “Either I take Belgrade, or the Turks will take me.” On August 15, the Turks sent a relief army which was destroyed allowing Eugen to take Belgrade, one of his greatest military campaigns.The Treaty of Passarowitz, signed in July,l7l8, gave the Banat, Belgrade, and most of Serbia to the Austrian Hapsburg Empire under Charles VI. The ethnic German population of Vojvodina was settled during the reign of Austrian archduchess and queen of Hungary and Bohemia, Maria Theresa, who ruled from l740 to l780. The Volksdeutsche were settlers from the Black Forest region of southwestern Germany, known as Swabia, or Schwaben, from the Suebi or Suevi,the Germanic tribes that settled the area. The German settlers were mostly farmers who cleared and cultivated the land once the Ottoman Turks had been driven out by Prinz Eugen.Vojvodina was part of the Austro-Hungarian Empire until 19l8 when it became part of Serbia and Yugoslavia. Before World War II, the ethnic German population of Yugoslavia numbered approximately 700,000,most of whom resided in the Serbian Banat.During the interwar years, ethnic Germans enjoyed full civil and cultural rights,had their own schools and representatives in the federal and local governments. Since 1920, the Volskdeutsche formed a national organization, Schwaebisch-Deutscher Kulturbund, the Swabian-German Cultural Union.The Communist dictatorship which seized power in Yugoslavia after the war, alleged before the International Military Tribunal at Nuremberg that even before the war, the German Government had organized the German minority in Yugoslavia: The Government of the Third Reich and the Hitlerite Party secretly organized the German minority.Settled in Yugoslavia by the Austrian emperors over a century ago...they had their mass organization...And out of this very organization and through it,as well as out of all the Germans in Yugoslavia, the Nazi Party created a political and military organ for the destruction of Yugoslavia. Jacob Awender, an ethnic German surgeon from Pancevo, was accused of advocating the “fullest and complete Nazification” of the Kulturbund in his paper Pantschewoer Post. Awender was further accused of leading the “Active” Youth, later adopting the name, Erneuerer (Rebuilders). In 1938, he was supposed to have transformed the Kulturbund into a Nazi organization on orders from Nazi officials in Stuttgart,Germany.Moreover, Nazi gaus were alleged to have been secretly formed in Yugoslavia and gauleiters were appointed. “Para-military Hitlerite organizations” were alleged to have been formed in the Serbian Banat and that Nazi organizers and instructors have inflitrated Yugoslavia to create the Volksdeutsche Fifth Column. At the Nuremberg War Crimes Trials, a branch of the Hitler Jugend (Hitler Youth), Hitler Youth on Duty, was accused by the Soviet Prosecution of organizing the Volksdeutsche of the Serbian Banat as a Fifth Column. The leader of the Hitler Youth, Baldur von Schirach, denied that the Volksdeutsche were organized from and by the Third Reich: “The Hitler Youth was never active in the Fifth Column either in Yugoslavia or anywhere else.”The Prosecution submitted into evidence a book by Sepp Janko,stated to be the youth leader in Yugoslavia in which the following excepts appeared:”I put at the disposal of the Fuehrer almost the entire German national group in the former State of Yugoslavia and gave him so many volunteers as soldiers.” An article by the Volksdeutsche Otto Kohler from the Bacska(Bachka) region was submitted into evidence,who wrote that: “Ninety percent of our youth are members of the Hitler Youth,the youth organization for Germans abroad.”Schirach admitted,however,the following: “I know that there were young people among the German minority in Yugoslavia...This German youth felt that it belonged to the Hitler Youth, and...these young people welcomed the German troops on their arrival.” Immediately before the German attack on Yugoslavia on April 6,l941, Adolf Hitler declared: “The German people harbor no hatred towards the Serbian people...It wants nothing from them.” Ten days before, Reich Minister for Foreign Affairs Joachim von Ribbentrop stated: “Germany itself-I declare here solemnly-has in this area neither territorial nor political interests.” In October,1942, the 7. SS-Freiwilligen Gebirgs Division “Prinz Eugen” (7. SS Divizija “Princ Eugen”) was completed and was transferred to the Uzice-Cacak region of western Serbia.In November, l942, the division was under the control of the 12th German Army, a component of the Army Group Southeast. The Prinz Eugen SS Division was formed to engage the Yugoslav guerrilla and resistance movements,consisting of two major groups, the Allied-supported forces led by General Dragoljub-Draza Mihailovich,the Yugoslav Army in the Homeland, Homeland Army, or the Free Yugoslav Army, but referred to as Chetnici,(Chetniks) and the Soviet-backed forces led by the Croat-Slovene, Josip Broz,known by his aliases, first as “Walter”,then as “Tito”, the Communist Partisans.Both resistance movements were overwhelmingly made up of ethnic Serbs, who dominated the guerrilla movements.Both guerrilla movements relied on the Serbian tradition and history of resistance to the Ottoman Turks. Josip Broz had been a stabsfeldwebel (staff sergeant) in the Austro-Hungarian Imperial Army and fought against the Serbian Army during World War I. Broz became a POW in Russia where he adopted the policies of the Boshevik regime under Vladimir Lenin and returned to Yugoslavia a staunch Communist.Since l937, Broz was the Secretary General of the Communist Party of Yugoslavia. Mihailovich, who was a Colonel in the royalist Yugoslav Army,fought in the Balkan Wars of 1912-13 and was a noncommissioned officer of the Serbian Army during World War I,when he first fought against Broz in the Austrian Imperial Army. Mihailovich was promoted to General and made minister of war by the Yugoslav government-in-exile in London. Yugoslav Communists did nothing during the intitial German invasion of Yugoslavia because of the accord between Nazism and Communism reached in August, 1939 between Joachim von Ribbentrop and Vyacheslav Molotov, the Nazi-Soviet Non-Aggression Pact. It was only when Germany invaded the Soviet Union on June 22, l941 that the Communists of Yugoslavia mobilized to resist the “fascist aggressor”. The Yugoslav Communists under Josip Broz were armed and supported by Joseph Stalin’s Soviet Union who through the Cominform had influence over the Communist Yugoslav Partisans. In preparation for Operation White (Unternehmen Weiss), the Prinz Eugen SS Division was transferred by road and rail to the Karlovac-Zagreb area, from where it attacked east of Bihac with the launching of the Operation on January 8,l943. In May,l943, Prinz Eugen would be part of Operation Black (Unternehmen Schwarz), a plan to destroy the Serbian forces, Chetnici, in Hercegovina and Montenegro: ....It soon became obvious that the situation would not be improved by such measures as the expansion of the demoralized Croatian police and military forces. Large concentrations of Chetniks formed a constant threat to German forces in the event of an Allied landing, and the Commander-in-Chief, Southeast, directed that Operation Schwarz, under the Commander of Troops in Croatia, be undertaken in May and June to destroy the Chetniks in Herzegovina and Montenegro. The German Commander of Troops in Croatia, General Rudolf Lueters, assembled the following formations for the offensive: the lst German Mountain Division, which had arrived from the Russian front, the German-Croatian 369th “Legion” Infantry Division(referred to as the Teufel or Devil Division), the ll8th Jaeger Division, the lst Motorized Regiment of the Brandenburg commando formation, and the 7th SS Mountain Division “Prinz Eugen”.The Italians assembled the “Taurinense” Infantry Division, the 23rd Infantry Division “Ferrara”, and the l9th Infantry Division “Venezia”. Other Axis forces available for this offensive included the Croat 4th Jaeger Brigade and the Bulgarian 6lst and 63rd Infantry Regiments. Operation Black began on May 2, l943, concentrating on destroying the Serbian forces, Chetnici, in Herzegovina and Montenegro. During the first two weeks of the Operation, Serbian casualties were high, with scores killed and four thousand taken prisoner. General Mihailovich was forced to retreat to Serbia with the remnants of his command. The SS troops in Prinz Eugen massacred Serbian civilians as collective punishment for supporting the resistance movements.Entire Serbian Orthodox villages were burned down and the inhabitants,men,women, and children, massacred in punitive raids. The two German divisions then attacked Foca and Sarajevo, the Italians attacked Cetinje, the two Bulgarian regiments attacked Prijepolje, while the Prinz Eugen Division attacked Mostar in Hercegovina.The Prinz Eugen Division also deployed battalion strength elements northwest of Sarajevo. In August,l943, Prinz Eugen came under the control of the German Wehrmacht Xvth Mountain Corps (XV. Gebirgs-Korps), of the 2nd Panzer Army, Army Group F, when the Division occupied Brac,Hvar and Korcula. In November,l943,Prinz Eugen was placed in the Vth SS Mountain Corps (V. SS-Gebirgs-Korps). In December, Prinz Eugen fought with the Vth Mountain Corps in the area northest of Sarajevo and south to Gorazde. On September 21,l944, SS Obergruppenfuehrer and General of the Waffen SS Artur Phleps was believed to have been killed when en route from Montenegro to Transyvania where he was to form a front against the Red Army. In October, l944,Prinz Eugen was made a part of the Group Muller of Army Group E and it was redeployed to the Belgrade area to assist in the evacuation of 350,000 German troops of Army Group Lohr,retreating from Greece and the Aegean Islands. 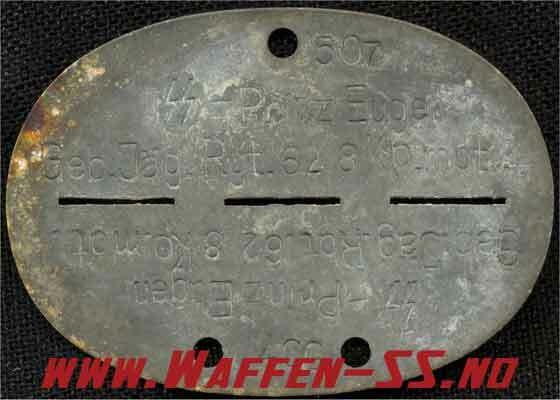 Prinz Eugen linked up with the Bosnian Muslim 13th Waffen Gebirgs Division der SS “Handzar” (Handschar) from Turkish hancher, “dagger”, and the remnants of the Bosnian Muslim 23rd Waffen Gebirgs Division der SS “Kama” from Turkish kama, “dagger” and the 2lst Waffen Gebirgs Division der SS “Skanderbeg” (Albanische No. 1), from Turkish Iskander and bey (Alexander the Great beg,the name for George Kastrioti), made up of Albanians (Shqiptari) from Kosovo-Metohija. Prinz Eugen created a bridgehead in the Vardar corridor in Macedonia which allowed Alexander Lohr’s men to escape. Eugen engaged Russian and Bulgarian troops, the Division suffering heavy casualties. In October, the Red Army captured Belgrade. Prinz Eugen retreated through Cacak,Uzice, Banja Bosta,Ljubovija,Zvornik,Bijeljina, to Brcko. In January, l945, Prinz Eugen, along with remnants of the Albanian Skanderbeg Division, fought the Russian and Bulgarian forces around Vukovar. The end of the Prinz Eugen SS Division came in May,l945 with its surrender. The Prinz Eugen SS Division was accused of “committing some of the worst atrocities attributable to any soldiers during the Second World War.” The Division murdered unarmed civilians, burned and looted homes and entire villages and districts and tortured and massacred men, women, and children. In May,l943, during Operation Black, Prinz Eugen invaded Montenegro from Hercegovina and occupied the Niksic district. The SS troops took punitive measures against the civilian population, burning down entire villages, torturing and burning civilians in their houses. Pregnant women, infants with their mothers, the frail and the elderly were brutally massacred. Entire families were massacred or burned alive in their houses: 121 persons, mostly women, were massacred, which included 29 children between the ages of 6 months and 14 years, and 30 persons between the ages of 60 and 92. On March 27, l944, Prinz Eugen launched a “purge action” from Sinj.On March 28,l944, Eugen overran the villages of Otok,Conji,Ruda, Dolac Dolnji,where all 834 inhabitants were massacred and their bodies burned. Over 500 houses were set on fire and looted. Following the defeat of Germany, the Communist dictatorship would impose collective guilt upon the Volksdeutsche population of Serbia by forcefully expelling them en masse. Many of the Volksdeutsche settled in West Germany while others settled in South America, particularly in Brazil, where they created a thriving community. The 7th SS Prinz Eugen Division established a reputation for ruthlessness against civilians and was accused of committing war crimes against Serbian civilians. This would be its historical legacy.